In-depth articles about the Inner Sea region's more esoteric divinities, from Achaekek, god of divine punishment and patron of the deadly Red Mantis assassins, to Besmara, the lusty queen of pirates and tamer of the fierce beasts that dwell beneath the waves, to Milani, vehement enemy of tyranny and slavery, to Naderi, goddess of romantic tragedy and forbidden love. Guidance on how to play an adventurer or create an NPC devoted to a particular god, including the clothing, texts, and holidays sacred to the faithful, as well as aphorisms common among their ranks. Obediences and boons that can empower all worshipers of each divinity, especially those with levels in prestige classes devoted to their faith. Details about each divinity's standing in the Great Beyond, as well as a look into the gods' personal extraplanar realms. Insight into the fascinating creatures that serve each divinity, including the unique astral deva who heralds Kurgess, the Strong Man, and the veiled trumpet archon who heralds Sivanah, the Seventh Veil. 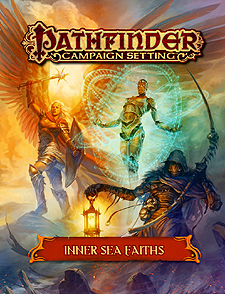 Pathfinder Campaign Setting: Inner Sea Faiths is intended for use with the Pathfinder Roleplaying Game and Pathfinder campaign setting, but can easily be adapted to any fantasy world.